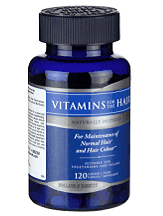 Basic Information: What is Holland & Barrett Vitamins for the Hair Caplets? This review for Holland & Barrett Vitamins for the Hair Caplets will be of immense help to people who have been searching for good supplements that can provide a lasting solution to the problem of hair fall. These vitamin supplements contain ingredients that are essential for healthy growth of hair and help reduce hair fall. It is available on the product‘s website and a few lesser known websites. This product is also available at convenience stores. One is supposed to take one caplet daily and preferably with meals. One is not supposed to exceed that recommended dose. Although there is no mention of side effects, it is advisable to consult a doctor before on starts taking these vitamins. Women who are pregnant and those nursing should consult their doctor before taking these medicines. There are two different sizes available. £7.99 is the price of one bottle that contains 60 caplets while £14.59 is the price of a bottle that contains 120 caplets. There are various offers along with the purchase of this product. There is a standard delivery that is for £2.99 or free if the customer spends up to £20. There is another option of next day delivery which comes to £4.49. They also deliver internationally within ten days at the shipping cost of £6.95. After using the product for three weeks I could see a difference in the texture of my hair as well as it has helped in reducing my hair fall to a great extent. I will continue to use this product as it has shown promising results. Although the product contains natural ingredients and is free of any artificial sweeteners or colors and even free of preservatives, it contains soy which can cause allergic reactions. It is advisable that one consults a doctor before taking these vitamins. Women who ae pregnant or nursing should consult their doctors before starting these supplements. There is no warranty given by the manufacturer on the website nor are there any provisions for return or exchange that can be carried out. The customer reviews on the website run in hundreds and most of them have given very positive reviews. Since it contains natural ingredients and specifically mentions that it does not contain any artificial sweeteners, nor any artificial colors therefore it is safe to use. The product lives up to the claims it makes as well as being preservative free and is free of gluten, salt, starch, sugar , milk, fish, wheat and sweeteners; it caters to a wide number of customers who might be allergic to a few of these ingredients. The down side is the lack of commitment from the manufacturer’s side when it comes to warranty and return/exchange policy.